A SkyTrak powered golf simulator featuring Muirfield Village Golf Club’s signature par-3 12th hole will be open for play at the Golden Bear Club throughout the week of the 41st edition of the Memorial Tournament presented by Nationwide—giving spectators the opportunity to play Jack Nicklaus Perfect Golf, a new computer game that debuted last month. 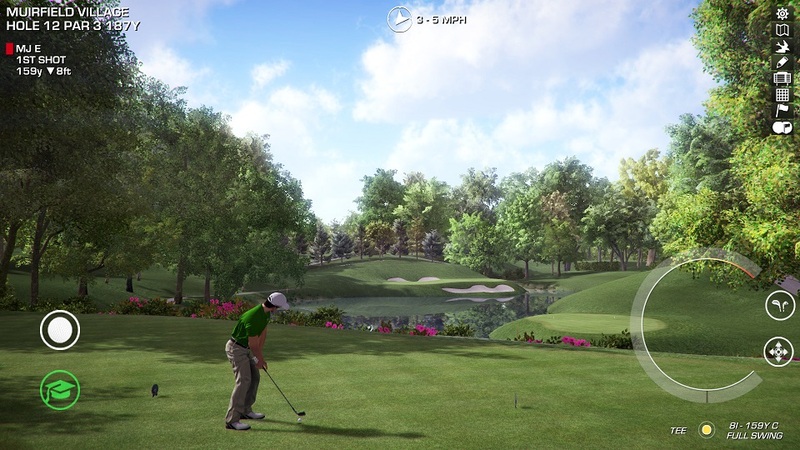 Memorial Tournament patrons who purchased the upgraded Golden Bear Club badge will have a chance to compete in a virtual closest-to-the-pin contest on an incredibly realistic HD model of the par-3 12th hole at Muirfield Village Golf Club. Daily contest winners will receive Nicklaus Golf Balls and the overall champion will have a chance to win a Jack Nicklaus-autographed pin flag. A demonstration of the Jack Nicklaus Perfect Golf Android TV Box version was also unveiled on two NVIDA SHIELD consoles as part of the week’s festivities. Eight tablets preloaded with child-friendly games were donated to Nationwide Children’s Hospital during a visit by PGA TOUR players. Stuart Appleby, Jim Herman and Camilo Villegas visited with patients in the rehabilitation unit and toured the Memorial Tournament Neonatal Intensive Care Unit (NICU) before the Memorial got underway. Each year, a portion of the proceeds from the Tournament is passed on to Central Ohio charities, principally Nationwide Children’s Hospital. The total contribution has passed $26 million with over $14 million through 2015 going to Nationwide Children’s. Jack Nicklaus Perfect Golf is the most realistic golf computer game the market has ever seen giving golfers, non-golfers and gaming enthusiasts alike hours of enjoyment designing and playing golf courses just like the Golden Bear himself has done for the last 50 years. Jack Nicklaus Perfect Golf gives players a completely customizable experience, bringing forth the expertise that Jack Nicklaus and world-leading Nicklaus Design have gleaned from designing nearly 400 golf courses worldwide over parts of six decades. Now, users can become expert golf course designers and architects too. Nicklaus Design Course Forge, the in-game course designer, is the same platform used internally by Nicklaus Design for its global projects. Not only can players dabble in golf course design–they can completely customize the surrounding landscape, selecting from a large array of camera angles, tracers, and graphics quality settings. The courses are also fully geo-referenced for future integration of real-world data and accurate sun angles, based on location. Perfect Golf has a global reputation in 3-D modeling and simulation for entertainment uses. Perfect Golf’s graphics have set the benchmark and have been used during worldwide broadcasts of the most notable tournaments on the PGA TOUR to digitally depict golf course ball flights, playing conditions, and design elements on some of the best-known golf courses in the world including The Presidents Cup 2015 at Jack Nicklaus Golf Club Korea, and will soon be featured in the return of golf to the 2016 Olympics. Jack Nicklaus Perfect Golf is currently available on Steam for Windows, OSX and Linux (www.jacknicklausperfectgolf.com). The game will be offered soon on a variety of other platforms, including consoles and Android TV.